At Peace Lutheran Church we partner with a wide assortment of non-profit agencies to do God’s work with our hands. Ordinary gifts, when used to help others .... extraordinary! ​A CareKit is gallon size ziplock bags which we fill with all sorts of items such as toiletries, socks, hats, gloves, t-shirts and gift cards. We keep the CareKits in our cars and give them to folks we encounter asking for help. We learned the following story. About 2 years ago a woman was in an abusive relationship and left with the only the clothes on her back. While homeless she was given a CareKit. She found her way to a shelter in Nashville, whick helped her get to a shelter in SC. She now has a job and her and her daughter are in their own home. ​We work with Blood Assurance several times a year to host blood drives. Each unit of blood donated saves 3 lives. All of the blood donated supports our local hospitals. End Slavery Tennessee provides specialized case management and comprehensive aftercare for human trafficking survivors and tactically addresses the problem through advocacy, prevention and training front line professionals. Peace Lutheran Church assists End Slavery by helping with fund raisers and making community presentations. ​​The Well; which is Spring Hill’s food pantry. Peace Lutheran Church appreciates the good work The Well is doing in our community. We help with fund raiser, food drives and assist with cleaning their facility. Habitat for Humanity works across America to build affordable housing for those who need it most. We are proud to have worked on multiple builds in our part of Tennessee and look forward to our continued work Habitat for Humanity. ​We work with Disaster Relief organizations to rebuild homes after a disaster. The folks at Peace Lutheran Church have big hearts and willing hands. And some that are highly skilled in areas such as plumbing, electrical, and carpentry. ​Lutheran Services of Tennessee is working to assist those living in section 8 house to build relationships with surrounding neighborhoods. We help with this noteworthy effort by volunteers in their programs, fund raising and Pastor Ann leads a monthly Bible study. ​For the past several years Peace Lutheran Church as partnered with Spring Hill Funeral Home and Memorial Gardens to host a community Eggstravaganza. This egg hunt is held at the Funeral Home. In a very tangible ways this event ties together the Holy Week significance of death and resurrection. In addition to have hunts for 3 age groups, there is also an egg hunt for adults with cash and other prizes. ​Sew ‘n Sews: Typically meets the 2rd Wednesday of each month to make around 50 quilts each year. These quilts are then sent to Lutheran World Relief who ships them all over the world. The ultimate purpose of a Quilt is to provide warmth, an essential need for people in every climate. In addition to being a cozy, clean new bed cover, these Quilts, provide comfort to people we have never met, but they are also an object that is useful in ways you probably never imagined. ​Each fall as school is resuming, students of all ages are invited to bring their backpacks to worship for a blessing. Because we are blessed to be a blessing after worship 100 school kits are assembled for Lutheran World Relief. Women at Peace make the bags and the congregation pitches in to gather the 400 notebooks, 500 pencils, 500 pens, crayons, scissors, pencil sharpeners and erasers needed for the kits. Lutheran World Relief then sends the school kits all around the world to places where a child’s education is disrupted through war, natural disaster or poverty. Milagro is Spanish for miracle. The Lutheran Church in Guatemala has recently developed a Women's Center. This center provides housing and education for young women between the ages of 13-21 from poor rural communities to expand their life choices through education, work skills and opportunities. 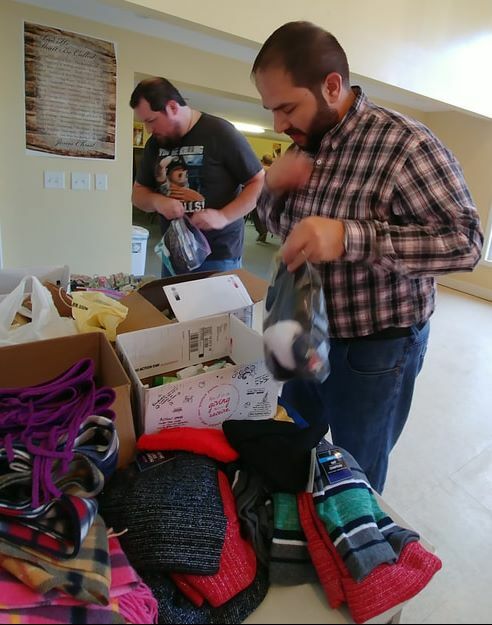 Folks at Peace Lutheran Church donate items for their annual fund raiser in Atlanta. Raising the funds needed to sustain the Women's Center for a year. ​Peace Lutheran Church is very excited about this new partnership. Lunches for Learning exists to break the cycle of poverty in rural Honduras by providing a healthy lunch to elementary school children every school day at their school; thereby allowing these children to stay in school so they can complete their education and enter the workforce as literate individuals.